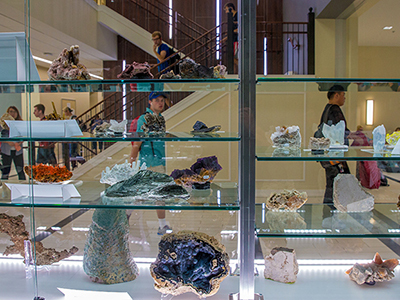 Students walk by mineral specimens in display case in Shideler Hall lobby. The Karl E. Limper Geology Museum provides displays of quality geological specimens intended to help students and visitors better understand and appreciate basic geological concepts. The Limper Museum contains hundreds of specimens of the world-famous fossils of southwestern Ohio as well as minerals, rocks, fossils, and meteorites from all over the world. The museum is located in Room 126 Shideler Hall, adjacent to the first floor lobby. You can't miss the large mineral display case and the 4-foot-diameter OmniGlobe digital spherical display from the lobby. Shideler Hall is just north across Spring Street from the Shriver Center and just east of the Armstrong Student Center. The museum is open to visitors but not all of the displays had been completed (as of October 5, 2017) in the recently renovated Shideler Hall.